BOSTON -- When Mike Lamb and I last spoke in the spring of 2000, he was embarking upon what many predicted would be a limitless, dizzying, wonderful career. 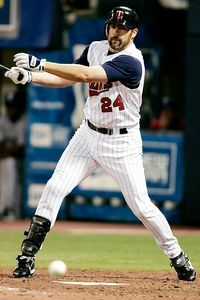 He was, at the peachy-cheeked age of 24, the Rangers' third baseman of the future and present; a former walk-on at Cal State Fullerton who, based upon the strength of a .324 batting average/21 HR/100 RBI season at Triple-A Tulsa in 1999, was now being counted on to provide sock to the Texas lineup. Mike Lamb, once a hot prospect, is now warming the bench for Minnesota. As one of Sports Illustrated's three baseball writers at the time, I was partially responsible for determining every team's "rising star" candidate for our annual major league preview issue. Some turned out to be dead-on (Pittsburgh's Aramis Ramirez; Florida's Mike Lowell; the Dodgers' Eric Gagne), some dead-wrong (San Diego's Ben Davis; Milwaukee's Kevin Barker), and most fell into that netherworld of sustainable mediocrity, such as Jason LaRue and Daryle Ward. Then there is Mike Lamb. What I remember about Lamb was the naivete. Sitting before me at the Rangers' spring training facility in Port Charlotte, Fla., was a quiet, eager, happy-to-be-here pup who trusted the organization and believed, in his heart, it had his best interests in mind. Then, shortly before the season started, the third-base job was handed to Tom Evans. I bring this up because I recently poked my head inside the visiting clubhouse at Fenway Park and serendipitously spotted -- of all people -- Mike Lamb, now a little-used reserve infielder for the Twins. He was sitting alone by his locker, laughing softly as "Semi-Pro" played on a nearby television. Unlike the boy of 24, the man of 32 has a veteran's weariness to his appearance. The beard that now adorns Lamb's face is speckled with gray jimmies, and the exuberance of what-can-be has been replaced by the burden of how-much-more? So I was curious: Is this what he'd imagined all those seasons back? Has the reality lived up to the dream? Is the .276 lifetime hitter happy? Appreciative? Over the moon? Lamb -- thoughtful then, thoughtful now -- paused pensively. "There have been some good times and some bad times," he said. "I've been blessed to do something a lot of people think they want to do. I played in the World Series [with the Astros in 2005]. I've been on the same team with legends." "But when people say, 'Wow, the dream job,' they don't fully understand," he said. "I know I have little right to complain, that I'm awfully lucky and blessed. I know that. But my grandparents are getting up there in age and I see them once per year. I see my sister once per year, my parents a couple of times per year. I have a 3-year-old son named Andrew, a 1-year-old daughter named Kayla, and my wife Teresa is pregnant. I went six weeks at the beginning of the season without seeing them, and I'll go five weeks at the end without seeing them." But, I interjected, what about the awesome perks? Swank hotel rooms? Chartered jets? Bottomless tubs of gum? "They're great," he said. "Great. I get paid a lot of money to play baseball, and it's a wonderful living. But I didn't hear Kayla's first words. That kills me. When I was home earlier this year, my son had barely walked. When I called a few days later, he was walking across the room. It's heartbreaking, and every day I question whether this lifestyle is best for my kids. You have to be a little selfish to do this line of work. That's how I feel, at least." What Lamb didn't say, at least not bluntly, is that -- despite what fans might think -- there is no such thing as a "dream job"; that every schlub who believes in the right to mercilessly heckle a ballplayer because he's "living the life" needs a few lessons at decency school. Unless you're a Derek Jeter or an Albert Pujols, the life isn't really the life. It's a nonstop struggle to prove yourself and stay relevant in a profession that spits most of its men out by their early 30s. That Lamb has lasted this long isn't merely an upset. It's a miracle. Lamb stopped talking. It was time for the Twins to do their pregame stretching, a ritual Lamb has endured more than 1,000 times as a pro. "I'd love to tell you it never grows old," he said, grinning.